If your thinking of a small downtown Fort Lauderdale Condominium building at a great price in todays Fort Lauderdale Real estate market, Gulfstream of Las Olas just of Las Olas Boulevard may be just the right choice. Located just blocks from Las Olas on a quiet street the building with its court yard pool sits directly across from the Himarshee Canal, a small quiet waterway which attracts a great deal of local wildlife. Read more about Gulfstream Las Olas with its 38 Ft Lauderdale Condo units. 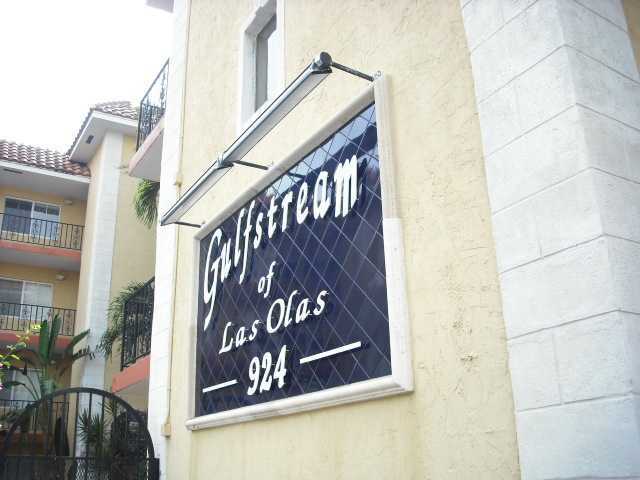 Gulfstream Las Olas is a small 4 story building just North of Las Olas Boulvevard. which was built in 1970.The building has the feel of an old Florida building, and features a court yard with a beautiful pool, lounge area, and a barbeque for use of the owners.Gulfstream of Las Olas features both two bedroom and one bedroom condominium units and make for the perfect Fort Lauderdale getaway. There is off street parking at this Fort Laudedale Condominium for all owners.Gulfstream Las Olas is a pet freindly Ft Lauderdale Condo and allows pets under 20 pounds. Owners at the Gulfstream Las Olas are allowed to rent their condos twice per year. Ready to take a look at Gulfstream Las Olas at Eric Miller and Associates - Keller Willaims Realty Fort Lauderdale, "We're here to help" at Gulfstream Las Olas or with all your Fort Lauderdale Real Estate needs. Contact us directly at (954) 383-8170.